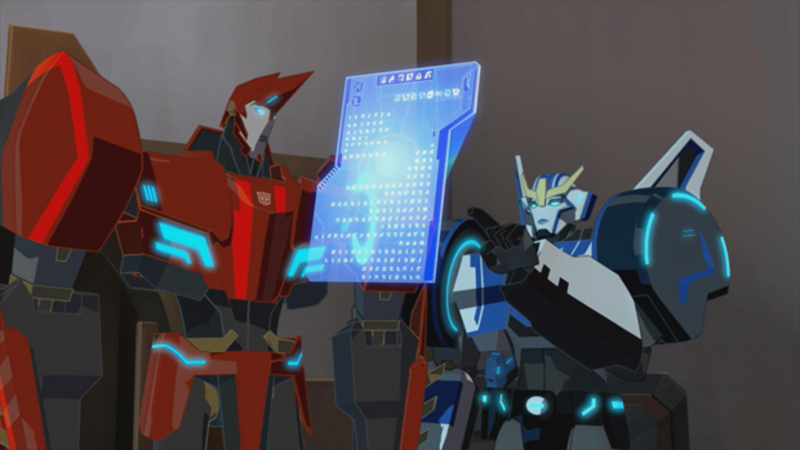 She's Fantastic: Transformers: Robots in Disguise - STRONGARM! Transformers: Robots in Disguise - STRONGARM! This character is a bit of mystery to me right now since the new cartoon Transformers: Robots in Disguise doesn't premiere until early 2015. All we know about Strongarm is that she is an "Elite Guard Cadet" and a member of Bumblebee's young Autobot team when he returns to Earth following the Predacons Rising movie. Aside from that, all we have are some graphics, some teaser video clips, and three (count'em, three!) action figures. The action figures make her out to be a lot bulkier than she appears in the animation, but even so, she is definitely packing a lot more muscle than previous Transformer girls (if you don't count Strika). I'm hoping we get another version of her someday with a more cartoon-accurate body, but if not, I'm still very happy with this Deluxe Class figure. There are also mini Cyberverse-style figures and blocky One-Step-Changer figures on the toy shelves right now. I love it how I have to pick and choose because I'm running out of room on my fembot shelf (!). I never thought I'd see the day. Strongarm transforms into a boxy armored police car. She comes with a single accessory of a blasting gun. 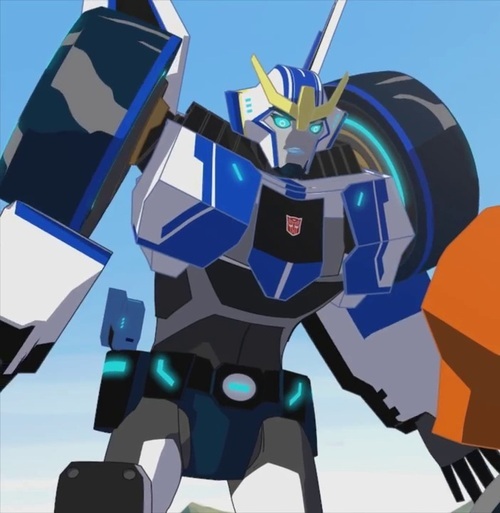 Here are some graphics of Strongarm from the web. Here she is with Windblade and First Edition Transformers: Prime Arcee. Well If you're running out of room on your fembot shelf, I probably shouldn't mention Generations Arcee and Chromia, along with the Mastermind Creations Fembot series. Already have Arcee and Chromia (reviews coming this weekend), and the Mastermind Creations figures are bundled in a preorder (ie.. i won't be getting Azalea until the elita one figure comes out). I also just won a cheap Flamewar on eBay who I've made room for. It's a very exciting time for fembot collectors! Strongarm is pretty awesome. This is the first I have heard of her. Looking forward to your Arcee & Chromia reviews. Didn't know they were out yet. Yeah I'm excited to see how popular she gets after the new show. The Prime Arcee was a major player the last few years, so maybe Strongarm will get the same attention. I noticed that Arcee and Chromia are now in stock at BBTS and Hasbrotoyshop just listed them in the past few days. I found mine at Walmart on Monday.